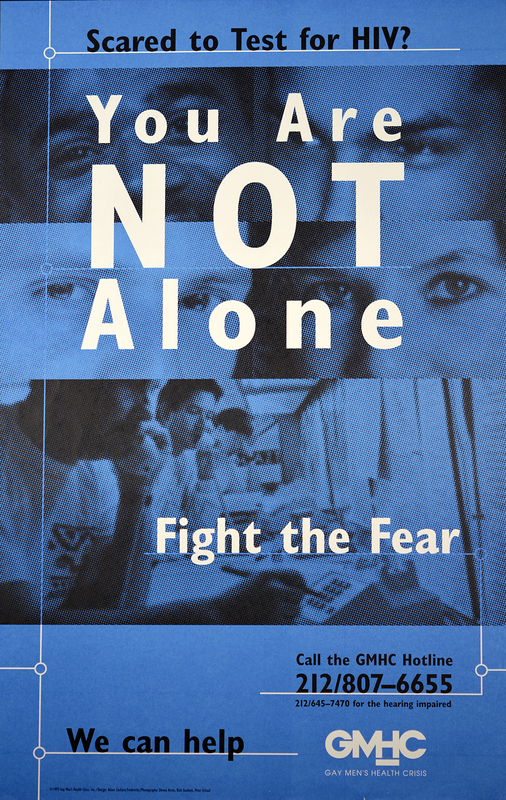 This 1995 poster, “You Are Not Alone,” from the Gay Men’s Health Crisis (GMHC), attempts to quell the fear that was, and still is, deeply entrenched in getting tested for HIV. Since 1982, the GMHC has been a leader in HIV prevention, care, and advocacy. In this poster, they reached out to people who were at risk of having HIV by encouraging them to “Fight the Fear,” call their hotline, and get tested. 1995 was a pivotal year in the history of HIV prevention and control. According to the Foundation for AIDS Research, AIDS deaths in the United States reached an all time high in 1995, and was the leading cause of death among Americans aged 25-44. In response to the growing number of HIV infections in the United States, the National Association of People with AIDS launched the first National HIV Testing Day (NHTD) on June 27 to promote HIV testing and early diagnosis by those at risk for HIV infection. Now, the Centers for Disease Control and Prevention (CDC), AIDS.gov, and other groups organize NHTD annually on June 27. The CDC states that nearly 1.1 million people are currently living with HIV, and almost one in six don’t know they are infected. This year’s theme, “Take the Test, Take Control,” encourages people of all ages to get tested for HIV and refuse to let fear and misinformation prevent them from learning their HIV status. See this and other AIDS related posters from the NLM collection, and learn more about the experience of people with AIDS and their critical role in the political and medical fight against AIDS in Surviving and Thriving: AIDS Politics and Culture.